Healthy doesn't have to be boring. Grain bowls are a treat for your health and your taste-buds. For the cauliflower, rub the spice mix and oil generously into the cauliflower slices then place on a baking tray lined with baking paper. Roast until golden brown (12 to 15 minutes), turn and roast until tender (a further 8 to 10 minutes). 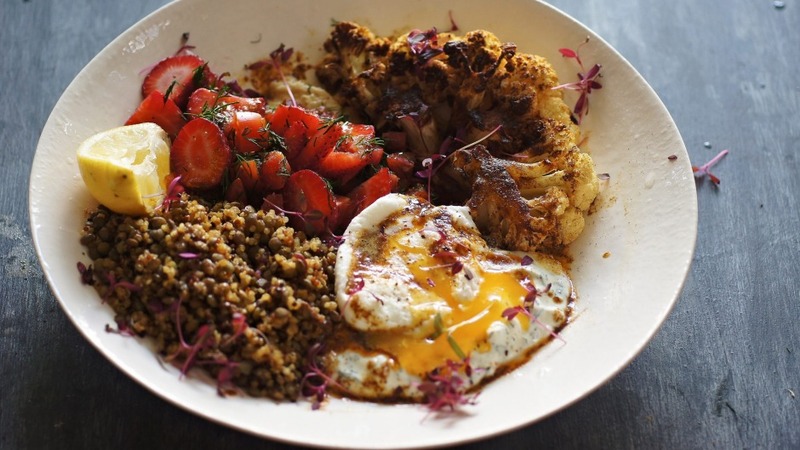 For the lentil and quinoa salad, add the quinoa and lentils to a bowl with the pomegranate molasses and stir to combine. Season generously then set aside. For the loaded hummus add the strawberries, tomatoes and herbs to a bowl and toss to combine. Set aside. For the Turkish poached eggs prepare the yoghurt base by stirring the yoghurt, dill, garlic, salt, and pepper in a bowl. Bring a medium saucepan of salted water to the boil. Reduce heat to medium and add splash of vinegar; using a slotted spoon, swirl water to create a whirlpool. Crack 1 egg at a time into a bowl and slide egg into water; poach until the white is firm but yolk is runny, about 3 minutes. Using slotted spoon, transfer eggs to paper towels to drain. To assemble, place a dollop of poached egg yoghurt mixture in the centre of each bowl. Top with an egg. Place a dollop of hummus next to the egg and top with the strawberry, tomato and herb mixture. Add a spoonful of the lentil-quinoa salad. Melt butter in a frying pan over medium-high heat. Stir in Aleppo pepper and salt; drizzle over the egg, yoghurt and grains. Season generously, scatter with micro herbs (if using) and serve warm.